There is a myth, or so we thought, that artists are somehow born knowing that they are artists. Such a myth is perhaps relevant for John Wunsch, a lifelong guitarist, composer, educator, and shop owner, who is somehow certain about his long and fruitful path in arts, long before he even know what arts is. The young John got interested in playing music by the age of 5, then started to play guitar and became obsessed with it at the age of 11. Even so, he had never thought of it as a career, until he was 27 years old and realized he had been making a living as a guitarist for over a year. Out of a curiosity, he went to a music school as a temporary switch while he was pursuing a career in law and politics in his college years. No one would have expected, perhaps even himself, that he would devote his entire life for music. 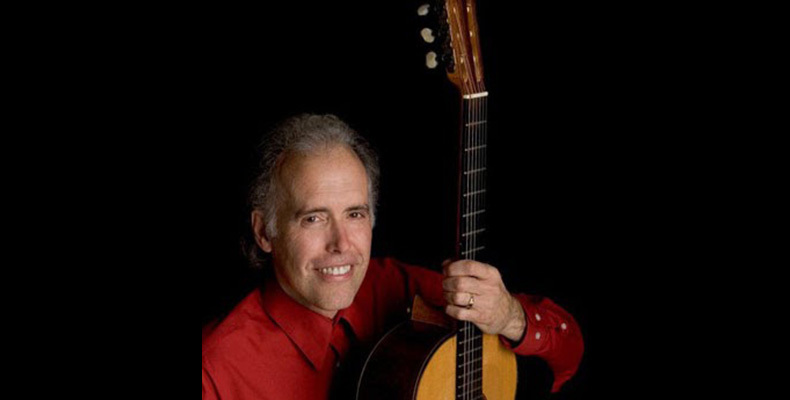 As an educator, he has been a classical and jazz guitar instructor at the Interlochen Arts Academy for 15 years, and founded the Interlochen Guitar Festival Workshop, in where he has reached over 4000 students from across the globe. Due to health concerns, he began a transition from the rigors of both teaching and performing in 2008, and fully retired from a career as a composer, performer, and educator in 2010. He became the owner of Strings By Mail since 2009, a web based store for musicians which sells music, accessories, strings and instruments and provides important information and guidance. John Wunsch’s story is for all of us musicians should take notice on: be humble, and let the heart be the ship to sail this vast musical ocean. From having a brilliant career as a composer, performer, and educator for more than three decades, to go through the transition as the shop owner, John Wunsch has certainly held a unique place in the world of music. Listen to the World: For more than two decades you have dived deep into the world of music education—far from the ‘bright spotlights’ of fame—after having walked a brilliant ‘career’ as a performer and recording artist; what made you decide to ‘travel the roads’? John Wunsch: I think the decision was made for itself. A career in the Arts is something one does because one cannot stay away from it. Another way to say this is that I did it because my heart demanded it, I could feel it was necessary for me to keep my sanity, or health, or happiness. It was not thought out, but felt and known. I did not see it coming but finally when I was there I knew it. In relation to your experience going through those two worlds (the performing world and the teaching world), can you explain the differences between the two? And in your opinion, is it possible for someone to go through both worlds at the same time, and achieve the same excellent results? The two are completely intertwined, but very different. The experience is very different in the day to day. During the 20 years when I was only a performer my concentration was purely on performing and creating the music itself better and better. I was absorbed in each day’s performance and preparation for that moment of “playing” the music. Later, when I also was teaching, I found my concentration was diverted to how I communicate that experience and guide another through it. I was not only directly trying to better myself and my life became much more involved in how my students were going to succeed. I had to help them understand what it takes to live well and perform well, because one must live well to perform on the highest level in any sense of totality But now without only directly trying to make myself better it resulted in my becoming a better performer. I did not know it at first but as the years went by it was obvious. By helping the others I came to totally own and understand my skills. Yes one can do both and achieve excellent results, but they will not be the same. One is not necessarily better than the other. But in my case I believe doing both made for better results. Remember musicians such as Bach and Beethoven taught. In some way I think every musician should teach, if you are given the gift of music you ought to share it. You have a long experience as an educator, both in the university level and at the university preparation level during your time as a teacher at the Interlochen Arts Academy. Can you explain what challenges you faced at the two levels, especially in addressing the age difference as well as maturity level of your students? I found it harder on the preparatory level, because they need more support in simply learning how to approach the process of improvement. They needed more help to control all the other parts of life that can interfere, or support learning music. But I liked this even better because it was a chance to get them started with the best habits, and not have to spend so much time changing poor habits in life or in playing. A younger student is more likely to need more, but they are less likely to have problems that you cannot change without greater effort. Of course there are students on the higher level without bad habits and that is a fine student to have as well. Regarding the Interlochen Arts Academy, in your opinion what has made the institution so well respected as one of, if not the only, most excellent musical education institute in the world all this time? It is simply the environment of passion for excellence. Students and faculty both know when they come there that it is a place with a great history for excellent accomplishment, and so they too want to accomplish things on that high level. And because in addition to maintaining a high artistic standard it also requires very hard work on academic subjects, one can only succeed with the greatest drive that only exists if one becomes passionate. It is hard and it is challenging and that fact encourages and even really requires passion. Finally all these people (students, staff, & faculty) inspire each other with the obvious passion they exhibit so the impact on the entire community is obvious. In addition to adequate mastery of playing techniques, what other aspects do you consider basic necessity to become a good musician? First is the ability to let music actually move you when you perform it. The greatest value of music lies in how it can connect one soul to another. That connection occurs when the performers heart, not just his or her mind and hands, but heart connects to the music. The audience senses this and that triggers their heart to be open to the music. Now there is true communication among souls in that magical language that goes beyond words. Of course there must be a balance, one can be so constantly moved that one does not get the important technical work done and cannot actually learn the music because they are moved beyond concentration. But that is rare. And in addition it is necessary to find health of mind, body, and spirit and this needs to be cultivated always and will improve over a lifetime. But without it there will be serious limits to what a musician can accomplish, so it is a very important skill as well. Oftentimes a child has incredible talent and enthusiasm to become a musician; but sometimes this comes to a head with the parents’ differing wishes. How do you see this problem? Well I have personally experienced this with my students and their parents and I find it is usually just a fear for the future of the student by the parent. There is a fear they will suffer by being in the arts. I have answered this by sharing my understanding that most people are looking at the only “success” in music being the careers of the most famous. They know that it is not likely to be one of the most famous musicians, so they think that the chance of the child making a living and being “successful” is very small. But the fact is many, many musicians make a living and share the gift of music with others while not being famous. Just like a shop owner, a laborer, a doctor, or any other person, a musician can have a quality life without being among the most famous. But society looks at the career of musicians and other artists in a different way than most careers. The tendency is to think if one is not among the famous one is a failure and suffering. Suffering as a musician is like suffering in any career, it can happen but in some way we all have the opportunity to make decisions in what we expect of ourselves that will allow us to avoid the suffering. If we actually enjoy what we do, not the admiration of or status granted to what we do by others, then we avoid the greatest danger to a satisfied life. The music “industry” has formed the composer/musician into an income generating profession; one of its consequences is that success is measured by the size of income received (and how popular the musician is in public). Motivation to create thus becomes focused on how to create a work which will ‘sell’. Is this a problem for you and the arts education world in the United States? For education it probably is primarily an issue if it distracts students form considering traditional instrumental education and styles of music for study, so music education could lose importance. So if educators can find relevance in popular forms of music but thereby bring the value of more complex forms of music to the student, then it will be OK. Then I think that for the individual artist it is only as big a problem as we allow it to be. Some individuals will really only truly value the income aspect in their heart, and if so they can be very happy working toward that. Others really value the artistic and spiritual connection music can bring to others and for them they need to be careful of letting the industry machine take them too far from who they are in their hearts. If one can produce something that sells and have true connection to it, true pride in it, and manage to carry a message of value, then I think it can be a fine thing. It is only a problem for the artist if in the end they have no real satisfaction, again like anyone in any field of endeavor, we must be true to ourselves. Regarding the guitar as a musical instrument, what made you decide to choose the guitar as your main instrument? It was really not a decision I consciously made, it just happened. I had started with piano, and singing in choirs, and then played trumpet & clarinet. I certainly enjoyed all those, but when I saw a guitar played in person I was mesmerized and it took over, eliminating serious pursuit of any others. I think it was significant that the musician was playing Spanish flamenco influenced music. I know that music touched my spirit and brought me to the guitar. Can you describe what details must we pay attention to when assessing the quality of an acoustic guitar? I am most involved with classical guitars, which are an acoustic instrument, but there is also the “acoustic” guitar category, which as opposed to the ”classical” guitar category uses steel strings, not nylon strings. For both there is the playability and there is the sound quality. For any guitar playability can be adjusted to a large extent, In regards to playability the neck needs to not be misshaped by a twist or warped shape, it should be relatively straight with a slight bow, or relief in the neck to allow the strings room to vibrate. But if the strings are just a bit too high or low that can often be easily adjusted. On a classical guitar we tend to use a higher action if we what more sound and so each player makes a choice as to how high to set the action. With a steel string or “acoustic” guitar the action is usually pretty low to accommodate the higher tension of the strings. In regard to sound, while the sound can be adjusted some by the type of strings used it cannot be physically adjusted within the instrument very much. Bracing can be shaved some, but that is a touchy process that is seldom used except by the original maker. But keep in mind a guitar with a spruce top will continue to open up over the years (get louder and have a more open sound) if it is played enough, while a cedar top guitar will not tend to mature or change very much. So we want a guitar that has sound we like and we want a guitar that has a dynamic range. In other words it must be able to have a soft sound or a loud sound. For a classical guitar in particular we must have a range of dynamics to bring the music to life. A guitar that is just always loud or, as is much more common, one that just never can get very loud is limiting. With a good classical guitar we must not only have the ability to project the sound into a hall and have a general color (or timbre) we like, but we also need to produce a variety of colors (or timbres). If you play closer to the bridge does it have a different sound than when you play over the sound hole or over the fingerboard? Then it has a variety of colors to offer. Next what is your opinion of developments in electric amplification technologies in the repertoire of acoustic instruments during the past five decades or so? And in your opinion has this technological development brought significant changes in the general development of music currently? Well I think it has had a positive effect overall. As a guitarist I see that the guitar simply could not be in so many ensembles without being electric and amplified. So it has really expanded the possibilities tremendously. And it allows much bigger audiences to hear any given performance. There are some negatives. It has caused some acoustic settings, like the symphony orchestra, to loose support, and that is a shame. The sound and color of an orchestra is a wonderful thing, so I hope it continues to be a significant part of our music culture.. And it has many times encouraged the use of a piezo pickup system rather than microphones in recording which often leads to what I personally feel is a less complex, natural, and expressive sound for the guitar in particular. But I trust the technology will evolve to capture the actual acoustic sound more easily and keep that from eclipsing the natural acoustic sound of the guitar. When we watch and listen to classical music, compositions created for the guitar instrument can be said to be quite limited in number when compared to the piano and other string based instruments such as the violin and cello. In your opinion, why has this happened? I think it is caused by two factors. First the guitar has not been fully supported and on the classical scene for as long as some instruments, and second, it was not loud enough for many centuries to be easily heard in a large hall. The problems are now much resoled due to better instruments, strings, and techniques, and due to the use of amplification. So I think we will catch up fast. And of course in popular music the guitar is fully caught up, so the influence of popular music on more “serious” music will continue to help bring the guitar to the fore as time goes forward. In your opinion what big challenges are being faced by the world of music education at this time, and in the future? Education needs to keep up with the times. A student needs to be able to participate in the music of today, so education needs to help with understanding the technology and some of the basics of styles of world music that are a part of the modern industry and culture. The problem I see is that there is a great value in the discipline one gets spending years working to master a traditional instrument. I would not want to see this lost. And there is an important magic in feeling and sharing the physical creation of music on an instrument. And the theory of music is a challenge to the mind which offers a way to interpret and understand the very bedrock principles of life and energy, so learning that has tremendous value. So I sincerely hope that the ability to create musical sounds with computers and programing does not supplant the study of traditional instruments and theory in the education process. So far I do not see that happening, but if educators wait too long to blend the modern in then they may start to lose too many students and overreact, dropping the traditional all together. That would be the greatest problem. So the challenge is to blend keeping up with teaching some technology and modern style while teaching traditional music skills and knowledge. A further issue is the challenge to good reading skills caused by exposure to direct recording of one’s creations and to videos and recordings which allow more learning by imitation. But imitation has always been a big part of music education, However I think the average player now has less reason to want to read, and that is unfortunate. The reading ability allows the understanding of theory to be taught, and that helps education and the art form to evolve in a more rich and varied fashion. So perhaps the challenge is to be sure that musical literacy is not supplanted by ease of technology. You have ‘adventured’ as a musician and as a teacher for more than five decades, and currently you are even managing a web based musical supply store which you own & operate; what has motivated you to have done all this? And is there a mission behind all this? I am motivated by the fact life is amazing. When you work hard and accomplish things you feel this more fully, and that is a great reward. And I am motivated to do whatever comes before me that interests me, offers a me a challenge, and gives me a way to provide something important to other peoples. When I was a young musician I was just trying to understand how to make music, it was great challenge. Then when I could make music I was trying to make a living and gain recognition and encouragement, another great challenge. When I had accomplished that and overcame the challenges it offered however I was suddenly not happy with just continuing to make music and make a living from it, until I discovered I could actually make someone else’s life better with my music. I discovered this when I started playing my music in hospitals. Suddenly it all made great sense. That is because I saw and felt music providing something important for others. And then I understood how being onstage still mattered, because you can provide the meaning of music and use it in an experience of human connection. It was not just getting recognition and making a living. And years later when I stared to teach, the great reward was that I was helping others, and unexpectedly I found teaching made me a better musician. And now I know that the knowledge and availability of products and service that Strings By Mail provides to musicians all around the world is my new challenge and my new say of making a difference for others. Can you share with us one or two experiences which have touched you the most during your time active as an educator? It is interesting to me because I am very proud of my many students who have gone to very important top schools like Julliard, or the Royal conservatory among many others. And I have seen them perform so well and been very proud of that. But I have been most moved by a few cases when the student was very troubled when they came to me and I was able to be a part of changing their lives for eh better by the process of learning life skills through studying guitar in my studio. In one case the student was majoring in another instrument and was failing her classes and had been in violation of the rules. She was not going to be allowed to return the next year. But she came to ask if she could study in my studio. I felt she had true love for guitar and music. Therefore I persuaded the administration to let her return the next year to study in my studio. She became a wonderful student who had very good grades and no trouble with the rules and who studied guitar very well. In another case a student from another school applied to study with me at Interlochen. They had many problems with the rules of a school and were doing very poorly, failing the classes. They would not normally be able to enter Interlochen. But after extensive interviews I was persuaded he had the passion for guitar and persuaded the administration to allow him to enter Interlochen. It was a struggle but in the end he established the ability to get good grades and follow the rules and graduate. I felt that in both these cases I was able to be part of changing theses student lives, not just their guitar skills. That is what moved me the most. …And any words for Listen To The World? You have a huge and important mission, representing the important developments in a rich world of music that is often overshadowed by the “industry” of music will help keep the culture alive and vital. We will all benefit by the strength and health of musical diversity, so I encourage you to keep up your good work. Thank you very much Mr. Wunsch for your time, your kindness in taking this interview, and most of all, your contribution to music.